Get ready to rawk out: the Marshall Mid Bluetooth are great on-ear cans that crank it up to 11. Don't let the name mislead you: the Marshall Mid headphones aren't all about the mid-range, they're about the full spectrum of sound, from bassy low-end to sparkling high-end. The English company is well known for its stage monitors and amplifiers, which conjures up images of rock 'n' roll legends, giant guitar riffs and crashing drums. Has Marshall crammed all the energy of the stage into these on-ear Bluetooth headphones? We've been using the Mid Bluetooth Black headphones "on tour" for three months and have found them to be a great-sounding, rugged, well-built solution that's never let us down. 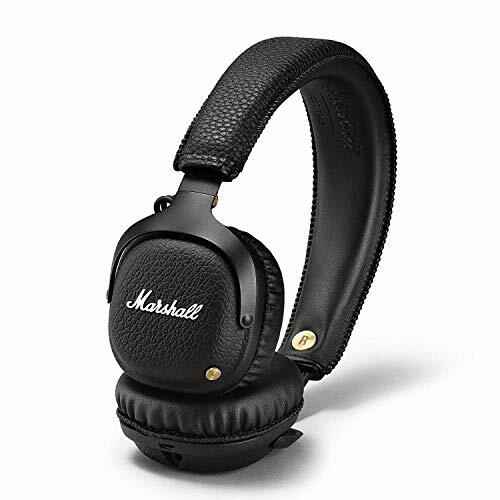 There's something iconic about the Marshall logo, which brandished on the side of the Mid headphones gives a not-so-hidden clue as to what these cans are all about. Rock-out sound. To look at they follow the same design language that you'd expect from a Marshall amp: textured, black surfaces sit alongside brass highlights, with the logo in white. It might sound fussy, but we think the Mid look elegant with their simple choice of colours and materials. These are also supremely tough on-ears. We've been throwing them into bags for months, without worrying about a case (as they don't include one) and the metal frame has held up just fine. Sure, the edges have rubbed slightly and there's the suggestion of a stitched thread coming loose - but given the treatment we've given them out on the road, they stand up well beyond what some of the competition can manage. Initially, the fit of these cans is a little firm to the ears, but the sprung earcups soon adapt to use and fit more gently over the head. We find them really comfortable now, partly because we're so used to them, partly because we don't wear these on-ears for hours at a time. That's one of the slight downsides: the Mid do begin to grate on the ears if worn for ages in a single session. Another feature we think really makes the Mid Bluetooth is the wired cable that's included. From its brass trim 3.5mm jacks, to the way the cable coils like a classic guitar or mic lead. Sure, the headphones are designed to be wireless, but they work just great wired for when the battery runs out too. That battery won't vanish too quickly, though, as it's good for 30-hours of use at a time. We've been getting through multiple days at a time no worries, so that long-lasting battery life quote seems accurate from our usage. Recharging is a case of simply plugging in via the Micro-USB cable on the base of one earcup. When used wirelessly the lack of controls at your fingertips isn't necessarily a problem either: the brass knob on the right earcup is a discrete way of adding play/pause control and it's easy to use. We've rarely bothered, in truth, but it's a far brighter solution than having giant skip/pause buttons on the side of the earcups. In terms of sound, the Marshall Mid Bluetooth are everything we expected: there's ample thrum, loud volume, with no one element overpowering the mix - just like a good rock track. There's bass aplenty, but it doesn't go into overdrive, while the mid and high-end are well catered for, without being too sharp or crunchy. Sound isolation isn't great, given the fit, and there's no noise-cancellation either to keep the loud outside world at bay - but that's not the end of the world. Marshall has never really been about throwing techie things at products for no reason, it's all about being classic and sticking to what it's good at: sound. If you're into hi-res audio then there's no aptX HD compatibility here, it's just aptX. That's perfectly fine for most file types, though, without appealing to the highest-end audiophile type. The Marshall Mid Bluetooth on-ear headphones are a mirror of the company's amps: classic, no-nonsense and great sounding. They're also rugged as heck, will last you for donkey's years, while making a design statement in their own right. We've found them to be great for use all around the globe. If there are any shortcomings it's that some other similar-priced headphones might offer a more exciting listen overall, long periods of wear aren't the most comfortable, and there's no added thrills from noise-cancellation or improved isolation. But most of that is added noise that we're not fussing about. The MSR7 strike the perfect balance of sounding great and being comfortable - without destroying your bank balance. As they're over-ears they might be too bulky for some, however. Despite their plastic build, the BackBeat Pro 2 feel sturdy and are very comfortable to wear - even for extended periods. They come with heaps of on-headphones control features too.